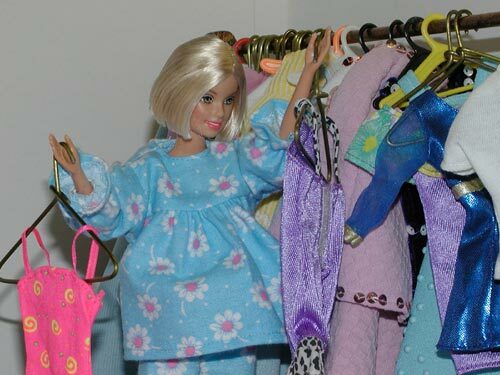 It all started one Saturday morning when Barbie got out of Bed to get dressed. As she dug through her drawers looking for something to wear. She felt she couldn’t find a thing to wear, so she headed for the closet. Sorting through her entire wardrobe, this was to big , that too small, this she has just worn far too often. She still found nothing. She was tired of all the clothes she had. Even though her drawers were full and her closet was over flowing. She wanted something different she was tired of wearing the same old things. 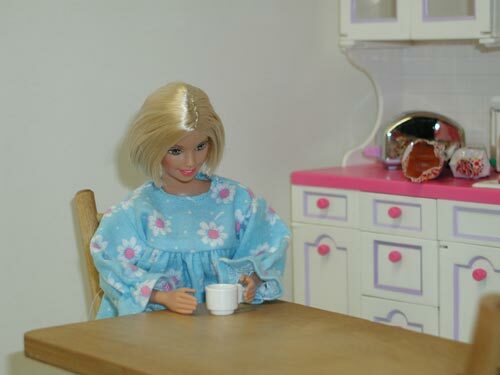 As she sat drinking her morning coffee thinking about what to wear, depressed about her current wardrobe. She suddenly thought “I will go shopping”. So she dressed in a pair of pants and shirt that were easy to get off & on. Grabbing her credit card. 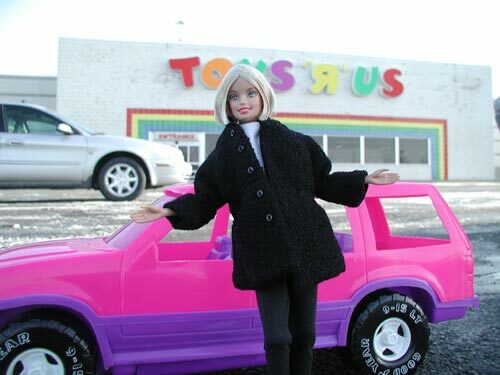 She was off to one of the major chains in her town she had bought from so many times before. After spending an hour & a half in the store she found nothing that she wanted. Many of the same old clothes she already has or just the wrong style. Leaving emptyhanded and not ready to give up yet, the day was young. 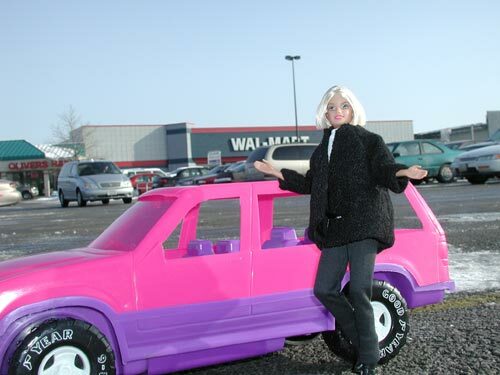 She headed for another major chain where she shopped before. After spending 2 hours there searching through – evening gowns – wild colors and some new belly styles she still could not find any outfit that she wanted. Leaving again empty handed. By now she was getting hungry from all the shopping and her stomach was growling. 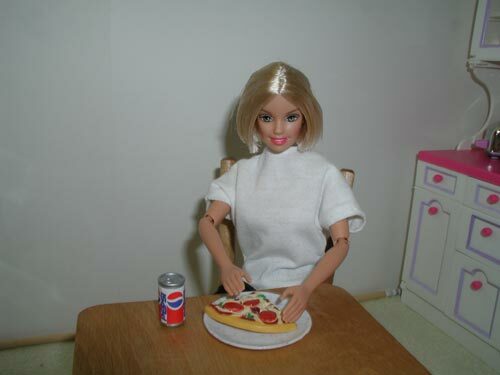 Not having much cash on her she went home to eat some cold pizza from the night before. Now heading for a state of depression over her shopping experience she sat and picked at the pepperoni on her pizza. Suddenly she remembered a girlfriend told her about this outfit she just bought off eBay. 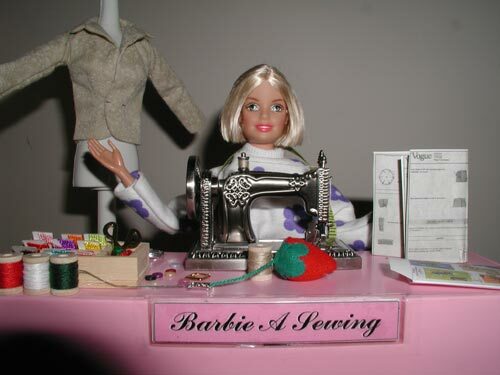 So Barbie grabbed her soda and headed for her computer. She logged on to the internet. After entering eBay’s URL, she gets the homepage. Looking around she sees a feature on the front page, “Barbie Fashions”. Smiling she clicked on the link following the links to clothing & accessories. The first page comes up, she scrolls reading the titles, Used Lot – Vintage Lot – Barbie fashion – Ball Gowns – Fashion Evening – Huge Lot – then clicking to the next page – Handmade Barbie Dress – She clicked. Up came a beautiful floor length gown, being modeled by Theresa. 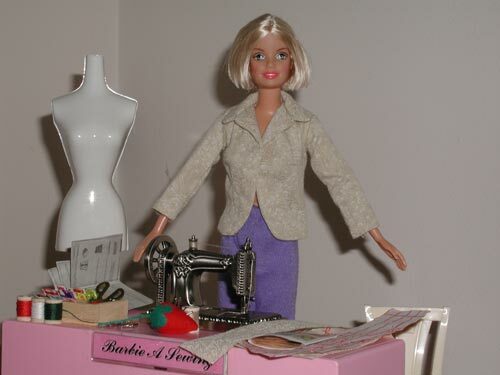 Knowing Theresa was close to the same size, She thought, ” I could wear that”, but Barbie had not been to a ball or party in years where she would wear something like that. She clicked back, another Handmade link, so she clicked to see another nice floor length gown, click back and going to the 3rd page, clicking every Handmade link she found finding – gowns – shorts – summer dresses – bolas – many nice clothes she liked, but it is February and she wanted something warmer more suited to wearing to work, like a warm skirt with a long sleeve jacked. 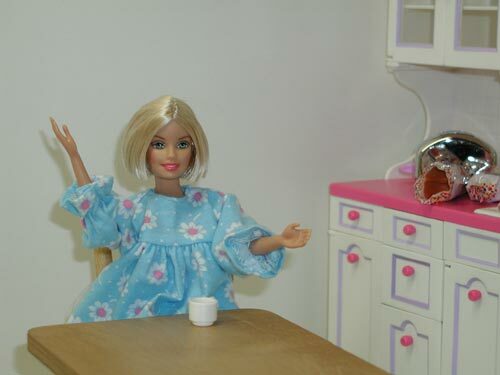 Barbie already had a lot of shirts and if she could just find a skirt and jacket that would match any one of her shirts she has, then she could switch it off with different shirts and feel like she has a few new outfits. She remembered the dress form and sewing machine in the attic that her grandmother had given her. The machine was old but “it ran good when she hauled it up there”, she thought. Looking at the clock, it was a little past 4. 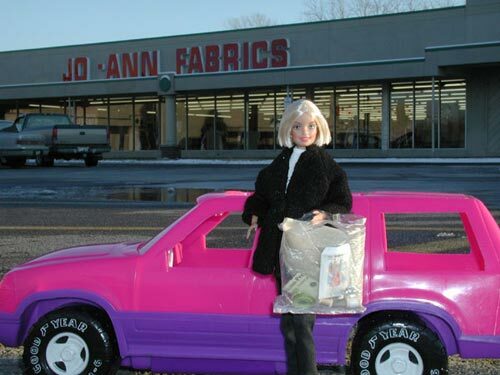 Barbie grabbed her coat and off to the fabric store she went. 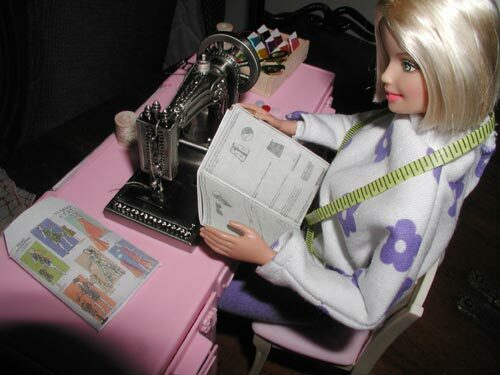 When she got there she looked through the Barbie patterns and found one she really liked and looked a lot like the one that SilkStone was wearing on eBay. She grabbed it up and put it in her basket. She found several other patterns she liked too and got them all at half price, “What a Deal she thought”. After picking out some fabric she picked up some needed sewing supplies, pins, measuring tape, buttons, snaps, scissors and thread. Excited she went home that evening and hauled the dress form and sewing machine down from the attic. She sat down to read the pattern. “WOW” she thought “there is a lot to making this outfit!” There were terms and directions that she did not understand, but she was going to give it a try anyhow. 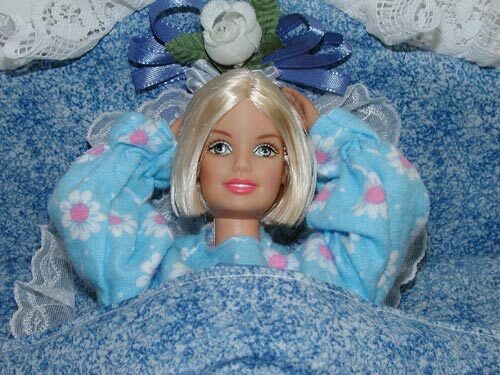 She lay awake for hours thinking about sewing her new outfit. The next morning she got up early – excited to get started, she grabbed a cup of coffee, then started cutting out her pattern. 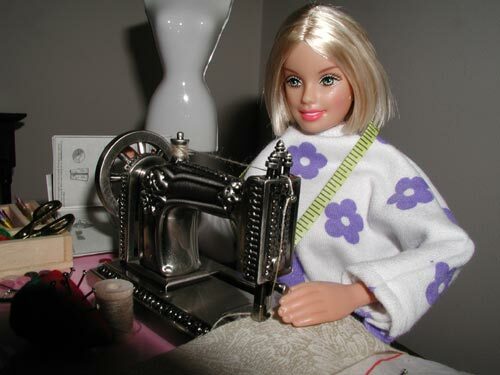 By mid afternoon she was busy sewing the jacket. As she went step by step following the instructions it started making sense. By that evening she finished the last bit of sewing on her jacket. Excited she tried it on “IT FITS!” She yelled! She then put it on the dress form, pinning it together so she could see where to place her buttons. She felt proud “MY FIRST HANDMADE JACKET!” She could see a few errors but they did not spoil her excitement over the jacket. She knew that she could make more and get better with each and every one she made. 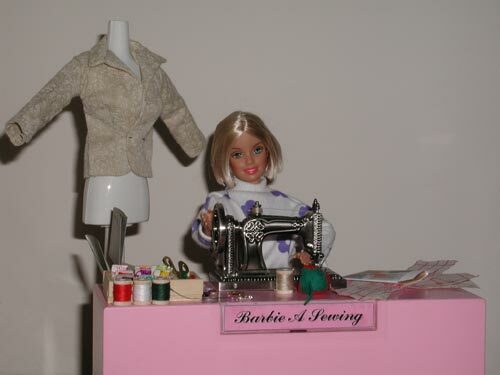 She then went back to her sewing machine and started making the skirt. Opening the doors to whole new world of fashion. Who knows you could maybe find one of her outfits in the future on eBay under OOAK! I would love to hear your feed back. This entry was posted in Barbie on April 14, 2018 by iDebra.